Alright, it's absolutely beautiful outside today. So what's up with this predicted flooding? All that rain is flowing right past us. And it should be impressive. The river's at 15.4' this morning (moderate flood stage), and predicted to crest at 18' (major flood stage) on Saturday morning. But the recent spate of lovely weather means that the flooding should pass quickly--today's prediction has the water level back under 17" by Monday morning. 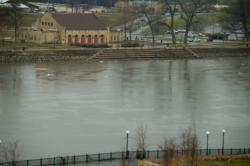 St. Paul police have closed all the river roads and parks, and are discouraging people from walking down by the river. But you can get a stellar view of everything from outside the Museum on Kellogg Plaza, or inside the museum from the Mississippi River Gallery on level 5. NOAA flood prediction: Up and up.Courtesy NOAAWhen I woke up this morning and checked the NOAA flood forecast for the downtown Saint Paul station it was at 19.7 feet above the normal stage. Yikes, the forecast still keeps going up. 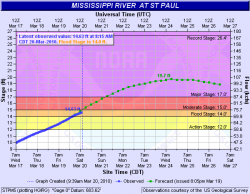 The river is predicted to crest on March 24th (next Wednesday). The StarTribune visits the NOAA, National Weather Service Weather Forecast Office, in Chanhassen, MN. The scientists at NOAA explain what's different about this year's snow melt...complete with some classic Minnesota accents. 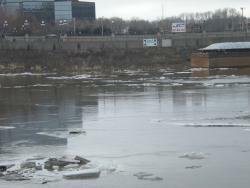 Check out what downtown Saint Paul looked like in the 2001 Mississippi River flood. So far, no one's predicting this year's food will be as bad as that historic spring melt, when the river crested at 23.67 feet. And, for purely nostalgic purposes, here's a pic of Minnesota Governor Karl Rolvaag (he's in front of the guy with a bag on his head), President Lyndon Johnson, and Senator Walter Mondale (looking quite dashing back in the day) standing dangerously close to the river in the really bad 1965 Mississippi river flood. The river crested at 26 feet that year. 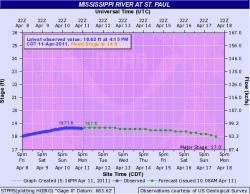 The Mississippi River here in Saint Paul is currently forecasted to crest at 19.8 feet next Wednesday and was measured at 12.9 feet at 7:00 this morning (Friday). All these river height numbers got me thinking about a really good question someone asked me last year about just what these numbers mean and how they are measured. 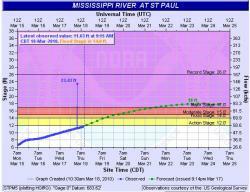 Here is an explanation: The Mississippi here in Saint Paul started being measured way back in 1893. The actual location of the measurement station is right by the High Bridge on the west side of the river. Currently the station is operated by the US Geological Survey and the US Army Corps of Engineers. At the time that the station was established, an arbitrary 0 measuring point was chosen (probably the bottom of the channel at the time). When the river reaches 14 feet at this station it is pretty much flowing above its banks in the vicinity of the gauge. All this is to say that the gauge numbers aren't really measuring anything specific about the river other than its height above a point established over a 100 years ago. This means that gauge readings can only be compared to other readings at the same gauge. So if you call up your friends and family in Fargo/Moorhead today to compare notes about who is experiencing the worst flooding, you'll find that your Mississippi River measurement of 12.9 feet doesn’t look impressive by the measurement of over 35 feet at Fargo. And, your 12.9 feet will seem straight up puny compared to the 677 feet the Mississippi is flowing today at Prairie Island, Minnesota, where the river is measured against elevation. For details on just how river gauges work, check out this explanation the US Geological Society offers. 14.0 Portions of the Lilydale park area begin to experience flooding. 18.0 Warner Road may become impassable due to high water. 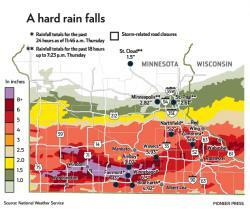 Want to learn more about floods and the Mississippi River? Stop by the Mississippi River Visitor Center in the lobby of the Science Museum and talk to a National Park Ranger! Volunteers in Fargo have been busy this week - they've placed 700,000 sandbags along the river, which should protect them from a flood of up to 40 feet. The rivers in North Dakota have also been busy — they've been tweeting. The Mississippi is going up FAST today, and forecasters expect that the river will officially reach "flood stage" by early this afternoon. (It's 10:45am, and the river's at 11.67'. It's risen a foot and a half in the last 24 hours, should reach 12' ("action stage") pretty soon, and 14' ("flood stage") by late today. So what's going on around the river? The city has closed all city boat launches and temporarily banned all recreational boating within the city limits. Water Street will be entirely closed, starting this afternoon. Hidden Falls and Lilydale regional parks are closed. 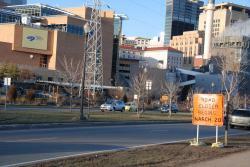 Flood barriers are going up at the St. Paul downtown airport and at Harriet Island. 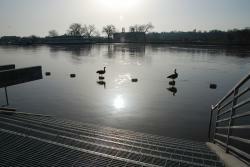 Harriet Island will close once the river reaches 17'. Warner/Shepard Roads will be closed from Chestnut Street to US 61 starting Saturday morning in preparation for the construction of a temporary levee that could withstand river levels to 26'. These roads could be closed for weeks, depending on the extent of the flooding. it appears to be moving faster. You can, of course, confirm these observations by investigating reports from gauging stations along these rivers, maintained by the U.S. Geological Survey. (See data for the gauging station serving downtown St. Paul.) But what is really happening? Until a river flows over its banks, it is considered to be in a “bankfull” state. In this state, the water flowing through the river is confined to a relatively fixed channel area. Simply put, floods occur because more water is being introduced into this channel from upstream, due to snowmelt, heavy rains, or a dam breach. As this added volume of water moves through a fixed area, it both increases in velocity and in depth until it overflows the banks, at which point some, but not necessarily a lot, of the volume and velocity moving through the channel are reduced. where Q = discharge, D = channel depth, W = channel width and V = velocity. Looking at this equation, it is easy to see that if discharge becomes greater and channel width is fixed, then an increase in both volume and depth (or height relative to the banks) is likely to be the cause. Discharge can be measured in cubic feet per second or cubic meters per second, for example. But is the river flowing at the same rate at the surface as it does along its banks and beds? Understanding this requires investigating some more detailed equations, as the banks and bed introduce friction, which affects the rate of flow. Leopold, Luna B.; Wolman, M. Gordon; and Miller, John P. (1995). Fluvial Processes in Geomorphology. Dover Publications, both classics for understanding how rivers work. 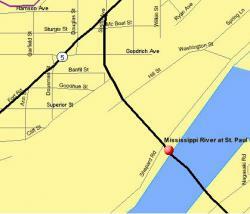 Also, check out our full feature on the 2010 Mississippi River flooding. Mouth of the Columbia RiverCourtesy U.S. Army Corps of Engineers Digital Visual LibraryHave you ever wondered what happens when a river ends and the ocean begins? Well, the scientists at the Center for Coastal Margin Observation and Prediction (CMOP) do. Based out of Oregon, the center conducts their research on the Columbia River. 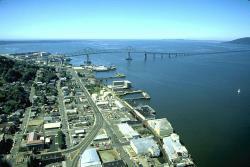 Their goal is to understand and predict how humans and the climate affect the costal margins. The research has three themes, to test and advance the way research is done, to understand the human and natural variables that affect the margin, and to integrate the two previous themes to create a functional research station. So, are you still contemplating the question, what is going on in this unique area where fresh water that has travel the country meets the salty water of the ocean? Well, the center has opportunities for K-12 students and teachers and undergrad and graduate students to become involved. Everything from summer camps and programs for middle and high school students to internships for the undergrad and grad students. Not interested in traveling? Data is also available on their website for the free-lance researcher. Before the next time you jump into the big blue, quench your thirst for knowledge and see what CMOP is doing to research and preserve the coastal margins of the Columbia.